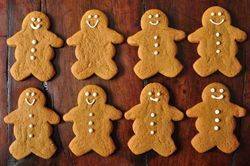 My Christmas baking wouldn't seem complete without a batch of these cute Gingerbread Men. They are fragrant with molasses and ground ginger, cinnamon, nutmeg and cloves; the amounts of which can be adjusted to suit your own individual taste. If you like your Gingerbread Men on the soft side, bake them a little less than the recipe states as the longer they bake the harder they will become. There are a few ways to decorate your Gingerbread Men; one is to press raisins (or currants) into the dough before baking, or you can frost the baked and cooled cookies with confectioners' frosting. A fun idea is to use the Gingerbread Men as decorations for your Christmas tree or even as gift tags. To do this, pierce a hole in the top of each unbaked cookie using a straw or end of a wooden skewer. Bake the cookies until crisp and then thread a pretty ribbon through the hole and hang on your tree. In England and North America, we usually make our gingerbread with treacle or molasses. Molasses gives the cookies a nice chestnut color, adds a sweet flavor, and it also keeps the cookies moist. There are two types of molasses generally used in making gingerbread: light and dark. Light molasses, which I like to use, comes from the first boiling of the sugar syrup and is lighter in color and sweeter in flavor than the dark molasses. Dark molasses comes from the second boiling and is darker in color with a more robust flavor. Molasses is usually labeled as "sulphured" or "unsulphured" depending on whether sulphur was used in the processing. The unsulphured molasses is lighter in color and tends, I believe, to have a nicer flavor. Besides molasses, these Gingerbread Cookies are fragrant with ground cinnamon, ginger, nutmeg, and cloves. All these spices have aromas that are warm and fragrant, yet each has its own distinctive flavor. Ground cinnamon is described accurately in Jill Norman excellent book "Herbs & Spices", "a warm, agreeably sweet, woody aroma that is delicate yet intense; the taste is fragrant and warm with hints of clove and citrus". Ground ginger could be described as peppery with a subtle lemon flavor and ground cloves are wonderfully rich and spicy. Since ground spices have a fairly short shelf life it is best to buy in small quantities from a bulk food store that has a high turnover. The added advantage of buying them this way is that they are a lot cheaper than buying those small glass bottles from your local grocery store. Always store your spices in a cool dry place, away from heat (it is not a good idea to store them by the stove). Gingerbread Men: In a large bowl, sift or whisk together the flour, salt, baking soda, and spices. In the bowl of your electric mixer, with the paddle attachment, (or with a hand mixer) beat the butter and sugar until light and fluffy. Add the egg and molasses and beat until well combined. Gradually add the flour mixture beating until incorporated. Divide the dough in half, and wrap each half in plastic wrap and refrigerate until firm (at least two hours or even overnight). Preheat oven to 350 degrees F (177 degrees C) and place rack in center of oven. Line 2 baking sheets with parchment paper. Bake for about 8 - 12 minutes depending on the size of the cookies. They are done when they are firm and the edges are just beginning to brown. Remove the cookies from the oven and cool on the baking sheet for about 1 minute, then transfer to a wire rack to cool completely. If desired, you can press raisins, currants, or candies into the dough for eyes and buttons while the cookies are still warm. Otherwise, confectioners frosting can be used to decorate the cookies. Store in an airtight container. Confectioners Frosting: In an electric mixer (or with a hand mixer), beat the butter until smooth and well blended. Add the vanilla extract. With the mixer on low speed, gradually beat in the sugar. Scrape down the sides of the bowl and beater. Add the milk and beat on high speed until frosting is light and fluffy (about 3-4 minutes). Add a little more milk if needed. Tint frosting with food color, if desired. Place the frosting in a pastry bag fitted with a decorative tip and decorate the gingerbread men as desired. Makes about 3 dozen cookies depending on the size of cookie cutter used.